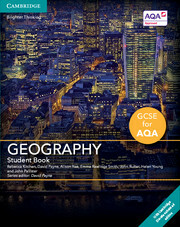 Written for the AQA GCSE Geography specification for first teaching from 2016, this print Student Book and digital bundle fully covers the AQA GCSE Geography specification. The full-colour Student Book provides dedicated skills development support and assessment practice and guidance, as well as a range of differentiated activities. 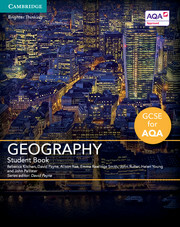 Guidance on carrying out fieldwork plus a range of up-to-date UK and international case studies are also included. The tablet-friendly Cambridge Elevate enhanced edition allows students and teachers to annotate text, add audio notes and track progress. This interactive resource also includes animations and videos to bring learning to life. 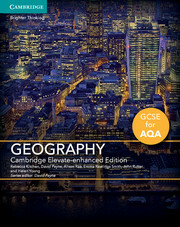 Covers the new GCSE specification and includes a two-year individual user Cambridge Elevate subscription. Includes guidance on carrying out fieldwork plus activities using primary data to help develop fieldwork skills. Issue evaluation spreads are included in every core section to develop analytical and decision-making skills and a range of up-to-date UK and international case studies demonstrate concepts in context. 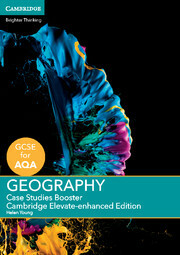 The Cambridge Elevate-enhanced Edition is fully customisable and interactive, allowing students and teachers to annotate text, add audio notes and link out to external resources. Features Assess to Progress, a tool which provides expert marking support, progress tracking and reporting to save teacher’s time.